Below is an article from Windermere's Chief Economist Matthew Gardner. He shares his views of the declining homeownership, and why he believes it won't be a lasting trend. In addition to talking about housing bubbles, another topic that is becoming popular among housing scaremongers is the ongoing decline in the U.S. homeownership rate. Remarks range from the direct, “American homeownership is at its lowest level in more than two decades,” to the downright inflammatory, “Rental surge to drop homeownership rate to 61.3% by 2030”. When I read statements like this it always drives me to dig into the data to see what is really going on. The data that everyone uses to track homeownership is provided by the U.S. Census Bureau, which publishes quarterly stats on ownership rates dating back to 1965. As you can see in the chart below, the rate remained remarkably stable between 1965, when it registered at 62.9%, and 1994, when it was 63.8%. For the purposes of this discussion, I have highlighted three presidential terms: two under President Clinton and President George W. Bush’s first term. The “boom times” for housing essentially started after the election of President Clinton, who went to remarkable lengths to encourage homeownership. Readers may remember the 1994 National Homeownership Strategy when the President directed HUD to come up with a viable plan to increase homeownership. 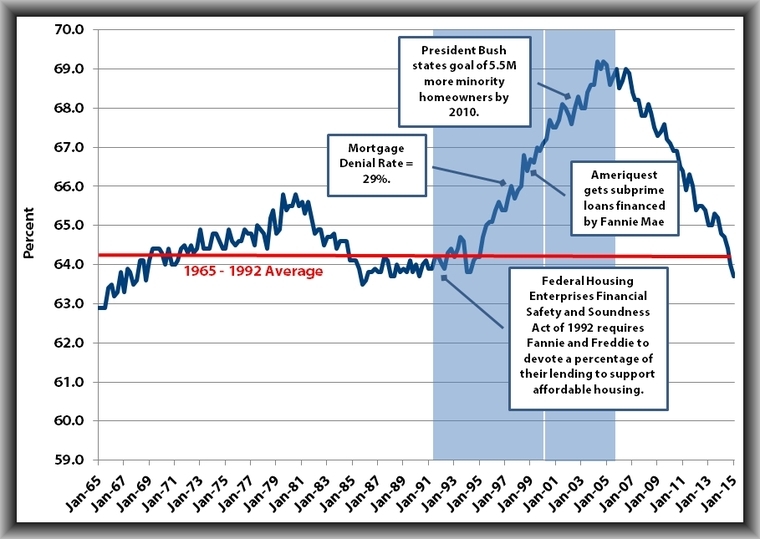 And it worked; during the Clinton administration, homeownership rose from 64.2% to 67.1%. During his first term, President Bush continued the practice of encouraging homeownership, as it dovetailed with his Ownership Society goals. His, and President Clinton’s efforts, led to the highest home ownership rates on record, peaking at just over 69% (about 5% higher than record-keeping averages). But as we all know now, it also led to the burst of the biggest housing bubble in our nation’s history. Yes, ownership rates skyrocketed, but the market was artificially inflated and unsustainable. Home ownership rates have since dropped to 63.7%, but this is only marginally below the long-term average of 64.3. Hardly calamitous as some are suggesting. That said, I do think that that the rate could fall a little further. Now, before you start blaming the Millennial generation, stop, because they are not the ones leading this charge. (As a side note, I do feel rather sorry for this group, as they appear to be taking the brunt of any and all economic woes at the moment.) If we look at homeownership rates by age, between 1994 and today, the decline in homeowners under the age of 35 is 2.5%. A palpable drop, but slight when compared to 35-44 year olds who have seen their numbers drop by 6% – from 64.4% to 58.4%. Why? Because this group took the largest hit following the housing crash, and many lost their homes to foreclosure. Circling back to Millennials, it’s true that this group is more subdued relative to homeownership – and there’s good reason for it. Millennials comprise a smaller share of married couples and a higher share of in-city dwellers versus suburbs. But their lack of growth may well be offset by middle-aged families who are thinking about getting back into homeownership again. According to RealtyTrac, while Millennials have gotten a lot of attention lately as the generation whose below-normal homeownership rates are changing the landscape of the U.S. real estate market, the boomerang buyers — who are primarily Generation Xers or Baby Boomers — represent a massive wave of potential pent-up demand that could shape the housing market in the short term even more dramatically. Data from Transunion supports this theory, suggesting that there are about 700,000 consumers who will become eligible to re-enter the housing market in 2015, and up to an additional 2.2 million potential buyers will requalify over the next five years. It’s likely that these so called “boomerang buyers” will become homeowners again, which will do its part to offset the Millennial drop, and raise the homeownership rate back up to its historic averages. So, have homeownership rates declined? Yes, but as the data and this analysis show, taking a simple “peak-to-trough” view of homeownership figures does not necessarily provide accurate results. Regardless of how many scaremongers declare otherwise. Visit the Windermere blog for the original article.